H.M.S. Racoon was a Royal Navy Beagle class destroyer. 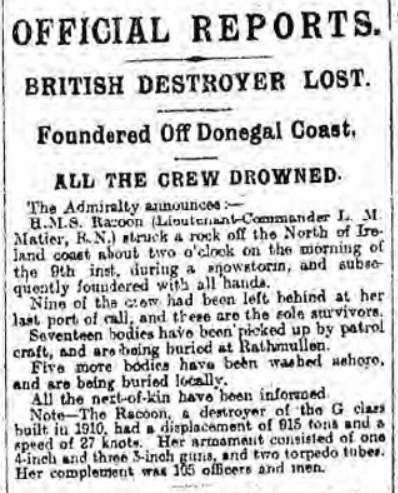 In November 1917, Racoon joined the Second Destroyer Flotilla on the Northern Division of the Coast of Ireland Station, based at Buncrana in Donegal. During the early morning of 9 January 1918, she was on her way from Liverpool to Lough Swilly to begin anti-submarine and convoy duties in the Northern Approaches. In blizzards and heavy sea conditions she struck rocks at the Garvan Isles just off Malin Head and sank with the loss of all hands. The navigational error was revealed in a subsequent enquiry when it emerged that Racoon was taken between the isles, rather than going around, which would have been standard in the weather conditions. Visibility failed and she ran straight into one of the islands. Lt George L.M. Napier and her entire crew of 95 men were lost. HMS Racoon now lies at a depth of 17m and can only be dived during slack water. 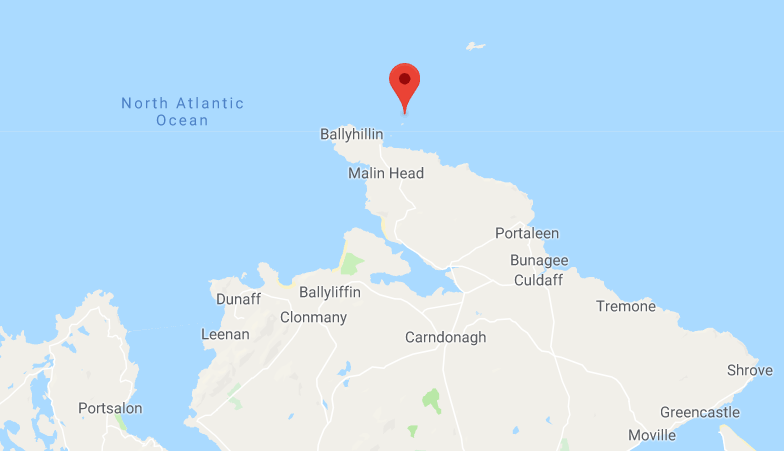 A few of her deceased were washed ashore in the locality and their bodies lie in graveyards across Antrim and Donegal as well as a few on the Scottish Isles. Those who were not recovered are remembered on the Chatham and Portsmouth Naval Memorials. Stoker (1st) John Greer, aged 25 from Ravenhill Road Belfast. Buried in Belfast City Cemetery. Ordinary Seaman Denis O’Reilly, aged 20 from Wolfe Tone Place, Cork. Remembered on Chatham Naval Memorial. Stoker (1st) Albert Edward Roberts, aged 22, born County Dublin. Remembered on Chatham Naval Memorial. Stoker (1st) Wesley Ferris, aged 24, from North Howard Street, Belfast. Remembered on Chatham Naval Memorial. Leading Stoker William Gallie, aged 24, born Belfast. Remembered on Chatham Naval Memorial. Stoker (1st) John Samuel Harvey (Gibson), aged 28, Zetland Street, Belfast. Buried Crossapol Cemetery on the Isle of Coll, Argyleshire.